In 2011, the West Tenn Diamond Jaxx of the Southern League changed their team name to the Jackson Generals as a tribute to the teams that represented Jackson, Tennessee in the Kitty League from 1935 to 1954. But who were the original Generals? The Jackson Generals: Minor League Baseball in Jackson, Tennessee introduces today’s fans to stars of the past like Jesse Webb, Dutch Welch, Ellis Kinder, Gashouse Parker, Mel Merkel, Gabby Stewart, Walt Mestan, and Hal Seawright. 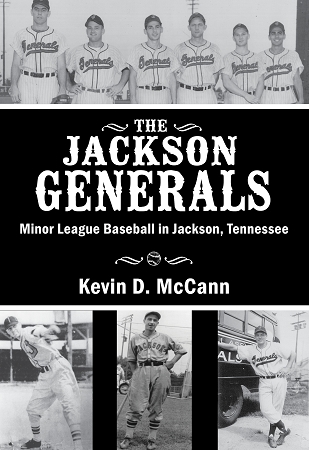 From the triumph of the team’s 1941 Kitty League championship season to the abysmal 26-game losing streak in 1954 that ended minor league baseball in Jackson, author Kevin D. McCann recaps each of the Generals’ 13 seasons with narrative and photographs. There’s also a section listing the all-time and single-season Generals batting and pitching leaders. A must-have book for every Jackson Generals fan!